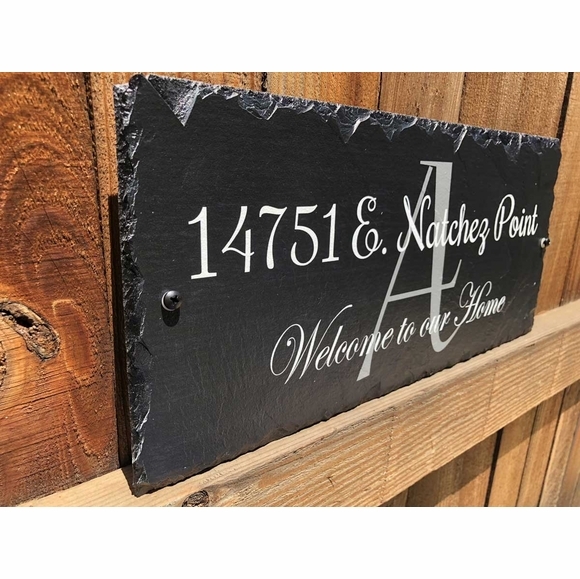 Welcome to Our Home Slate Address Plaque - - personalized with your address and a huge monogram in the center of the sign. "Welcome to our Home" is standard at the bottom. Made in USA. Three fonts: italics (shown above), and printed all caps. Address line on top holds the street number and name up to thirty (30) characters. Color: black with chalk white wording. Address number in large image: 14751 E. Natchez Point.